I love katie’s blog because she is trying to see the beauty and love in everything. I am so grateful she is letting me share my story about my husband and I. I won’t go into too much detail because that would be like a million part series, but I would love to share our Reader’s Digest version. Let me tell you a little bit about us. I was born and raised in southern California. My husband, Lavar, was born and raised in Nassau, Bahamas. We are different in so many aspects of our lives. He grew up in a home that didn’t have running water until he was in college. I grew up in an upper middle class white American family. He has bullet wounds and a knife scar from growing up in a bad area. I don’t know if I have ever seen a gun. He had family that bailed when times got tough (he lost his dad) and I have had so much family I can’t count. I tell you all these things because I want to show how love can prevail, no matter what family situation or what people think. We met in college. I cannot remember him for the life of me until our second semester and he remembers where I was standing, and what I was wearing the first time he saw me. J I actually had to pay for our first date because I lost a bet. Nice, Lavar, nice. We liked each other immediately but didn’t actually officially start dating until our junior year. In the meantime, we dated other people, were friends, didn’t talk at all, and then back to friends. 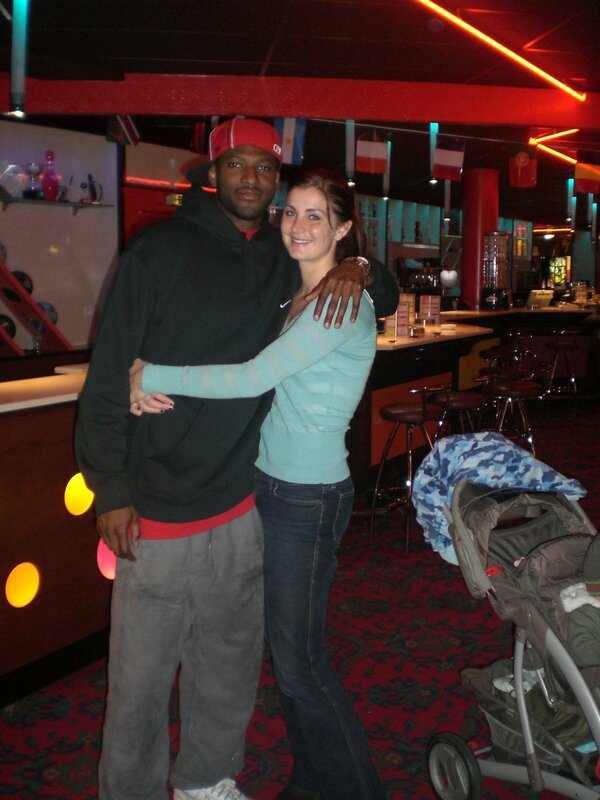 When we did start dating, there were quite a few people that were not okay with it because it was interracial. We had a lot of people against us throughout our college career, which made things rather difficult. We had to break up twice during his season because his coach, who was black, did not want him dating me. We actually were not allowed to talk at all for those 3 or 4 months out of the year. I was never the kind of girl to get ‘stuck’ on a boy. I didn’t let anyone get to me. Lavar was the only one who I couldn’t get out of my head, no matter what. Turns out, I loved him and haven’t stopped since! After we graduated college, our relationship was so much easier. We didn’t have anyone trying to tear us apart. We got married two years later and then up and moved to France. Our wedding day was one of my favorite in my life. So we have two races, two cultures, (thankfully one language), two upbringings, and living in a country that is neither of ours. To say it was hard would be an understatement. But let me leave you with this: Lavar’s pastor said this on our wedding day “Two cultures, two races, two countries, two people, ONE GOD.” I have loved that saying because it represents our life. Our family now. Yes, my son is wearing an undershirt and a scarf. Don't ask. And now we are a happy little family, with two monster boys living in France and enjoying life! I hope you have enjoyed our little story! I love that I was able to share it with you all and thanks so much for reading!